George Anderson is a professional musician and entertainer. His background is Gospel, Jazz, R & B/ Funk, Rock, Country and Classical. He attended the University of North Texas Music School, performed in the acclaimed One O’clock Lab Band and was the principal bassist in the NTSU Symphony. He was also a member of the Fort Worth Symphony and has played concerts with the Dallas Symphony. He has performed with many renowned artists including concerts with Ray Charles, Tony Bennett, Marvin Hamlisch, Chuck Berry, The Coasters, The Fifth Dimension, Doc Severensen, Bob Hope, Jay Leno, Willie Nelson to name a few. As a bassist, he performed for several television specials including the ABC national broadcast of the Texas Sesquicentannial with Johnny Cash, Jimmy Dean, Freddy Fender, B. J. Thomas and the Gatlin Brothers. He also performed with Ella Fitzgerald on the Good Morning America Show and with Della Reese on Channel 13. Currently George is recognized as one of the busiest studio session bassists in the Dallas/ Ft. Worth metroplex. He has recorded numerous local and national radio and television commercials including ESPN, CNN, Coors Light, and Coke. He is also playing on Channel 8 News and Channel 11 News. He has also played on many local, national and international artists’ recordings. George worked as a writer, producer, and bassist on the “To The Extreme” CD by Vanilla Ice. As a music producer, songwriter, composer/ arranger he has worked with many diverse artists. He is the leader of his own private party group The Signature Band (www.signatureband.com). He has worked as music director for many corporate functions, which include awards banquets for Dr. Pepper, Frito Lay, and Sally’s Beauty Supply, national conventions for Kawasaki, Century 21, Caldwell Banker, and for six consecutive years was the music director for Mary Kay National Conventions. George has also directed the music for sporting events such as the Cotton Bowl Hall of Fame and Dallas Cowboys pre-game activities at Texas Stadium. His work also includes movie soundtracks and documentaries. 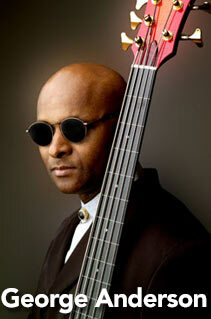 He also played on several “Barney” videos and is the featured bassist in the “Let’s Go To The Farm” video. He also played on Chucky Cheese Shows “in-house” soundtracks. George has also done volunteer work with community groups such as the Boys and Girls Club by writing and producing the “Say No To Drugs” song. He has also been a guest speaker for Black History Month. He has performed for numerous charity events such as the Cattleman’s Ball and Limbs For Life. George realizes that his talent is a gift from God and has used that talent to honor Him by performing in churches across the metroplex. He currently plays on Sundays at Prestonwood Baptist Church.